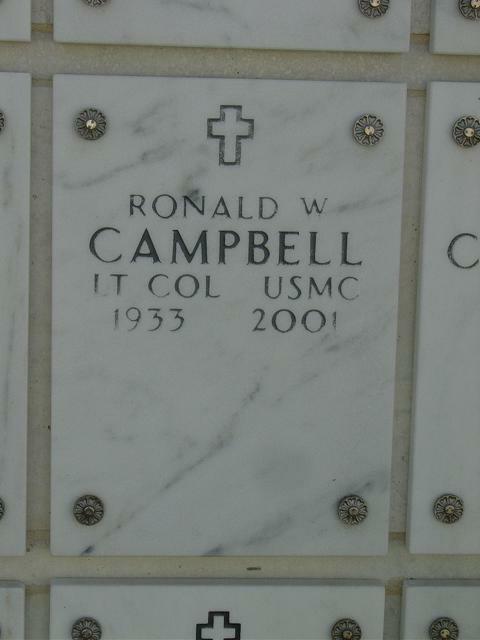 Ronald W. Campbell, 68, a retired Marine Corps Lieutenant Colonel who later did systems analysis for GRC Consulting, died December 31, 2001, at Inova Fairfax Hospital of chronic obstructive pulmonary disease. Colonel Campbell, who lived in Alexandria for 33 years, was born in Dayton, Kentucky. He enlisted in the Marine Corps in 1952, left military service to attend Xavier University in Cincinnati, then reentered the Marine Corps on graduation. During the Vietnam War, he received a Purple Heart and a Bronze Star in combat operations at the siege of Khe Sanh. In 1978, Colonel Campbell retired from the Marines. Shortly thereafter, he became a systems analyst for GRC. He retired there in 1995. Survivors include his wife of 44 years, Carol, of Alexandria, Virginia; four children, Jeff Campbell of Waterford, Connecticut., Rhonda Perry and Chris Campbell of Alexandria and John Campbell of Hampton, Virginia. ; three brothers; two sisters; and eight grandchildren. On Monday, December 31, 2001 of Alexandria, VA. Loving husband of Carol Campbell; father of Jeff (Sandy) Campbell, Rhonda (Joe) Perry, John (Carolyn) Campbell and Chris (Cathy) Campbell; brother of Edward, Albert and James Campbell, Evelyn Kiefer and Dorothy Murphy; grandfather of Patrick, Courtney, Colleen, Dylan, Miles and Stephanie Campbell, Joseph and Nick Perry. Funeral Mass will be offered on Monday, January 28, 2002 at 10:45 a.m. at the Fort Myer Old Post Chapel, Fort Myer, VA. Inurnment with Full Military Honors, Arlington National Cemetery. In lieu of flowers, memorial contributions may be made to the Franconia Volunteer Fire Dept. Inc., Fire and Rescue Station 5, P.O. Box 30600, Alexandria, VA 22310-9906.